Pulse Eight neo:4 Professional flagship 4×4 HDBaseT matrix with 2 mirrored HDMI ports, includes 4 HDBaseT 70m Class B PoH receivers. The Pulse Eight neo:4 Professional HDBaseT video matrix solution offers exactly what you need whether you’re a professional AV Installer or a residential user. If however, the source device does not support CEC, then you can continue to control it via your remote control as neo will automatically relay the necessary messages to your source device. In the UK, Sky (one of the main satellite TV providers) recently added CEC support, the way they did it was pretty interesting (simply press the “Sky” button and your TV turned on and so did the Sky+ HD box) and it gave Pulse Eight an idea, they could do this with neo. With Instant On, press the Sky button in any room and the neo will detect this, turn the TV on and switch the video path to the Sky+ HD box. Don’t worry if you are not in the UK, Instant On can be customised for just about any collection of source devices. neo supports more than just reacting to button presses. You can configure neo to turn your TV on at a specific time, or turn it off. View a certain source from 3 till 7 and then something else till 12. It’s all possible from within the web interface built into neo. 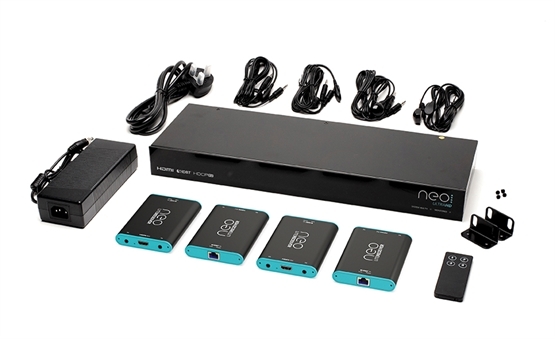 Mediacoms offer a full design and installation service for the pulse eight neo:4 professional and other devices, for more information call 01279 656983 or 020 8542 6882.